Travel Insurance | Special Feature | Small Business - Travelers | Webinars | Parting Shot | TRIVIA! In May the U.S Department of State issued a travel alert for US citizens due to the ongoing threat of terrorist attacks in Europe. 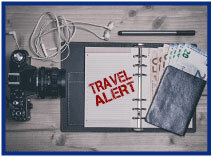 Travel alerts usually address problems of a shorter time frame, while travel warnings are issued for a longer period and ask individuals to consider very carefully whether they should travel to the specified country at all. Although there is not a travel protection plan specific to a travel alert being issued, travel protection may help cover the costs of your clients changing their tickets or paying for a non-emergency evacuation if a crisis does in fact occur while they are traveling. By purchasing a plan that includes trip cancellation or trip interruption coverage, your clients can receive up to 100% of their pre-paid trip cost when a politically-motivated terrorist attack occurs within the territorial limits of a city listed on the plan holder's itinerary and within 30 days of the departure date. The U.S. State Department must deem an event a terrorist attack, which then allows the terrorism coverage to become effective. Once an act of terrorism begins it is no longer unforeseen, and coverage is no longer available for plans purchased on or after the date when the attack was initiated. Travel Insured suggest your clients should purchasing a protection plan when they first book their trip. To receive coverage for a specific terrorist attack, the plan must be purchased the day before the attack occurs. Terrorism coverage allows cancellation if an attack takes place in any of the cities on their itinerary, which also includes stopovers. As a Big "I" Markets agent you can offer your clients travel insurance through our partner carrier Travel Insured. By investing in a plan with Cancel for Any Reason Coverage, they may cancel their plans and get up to 75% of their total trip cost for any reason they choose, including a travel alert. They just have to decide 48 or more hours prior to scheduled departure in order to be eligible. Before traveling, Travel Insured also suggests your clients stay up to date with current travel situations from the Department of State by signing up for automatic alerts and message updates through the STEP program. Big "I" Flood program carrier partner Selective continually aims to improve its service experience for flood insurance customers and for you, our valued agent partners. A reduction in the number of menu choices (five, down from nine) for quicker response. A change in the menu order to improve service - especially for claimants. An enhancement to the phone system: We'll automatically transfer your calls to your underwriting team based on your area code (when you select option 4 and then option 3 for Underwriting). If you have any questions, please contact your Territory Manager or the Selective Flood service team at (877) 348-0552. Learn more about the Big "I" Flood program at www.independentagent.com/Flood. How much is that doggy in the window? The one with the waggly tale? While we're not certain how much it will cost to buy Spot, you can now reach out to the pet store owner and offer them a BOP! Travelers Select Accounts offers a robust variety of coverages for small businesses. A proprietary BOP product, Master Pac®, workers' compensation, commercial automobile, and commercial umbrella are available, with a broad array of industry-specific coverage options and coverage extensions. We're pleased to announce that Travelers has now expanded its coverages for Pet Care Services and added Day Spas and Med Spas to their eligible businesses. Pet Care Services expanded coverages are overnight boarding and kennels for those involved in the medical treatment or care of pets and the sale of pet-related products, such as veterinarians, pet grooming (including mobile grooming), pet day care (or "doggy day care") and overnight boarding, pet sitters, and pet stores. Day Spas, Beauty Spas, Massage Therapists and Massage Therapy includes massage, non-medical facials, waxing and scrubs: may also offer hair and nail services and limited food/beverage service. Travelers Select is now submitted under the product name "Small Commercial Standard Markets" on Big "I" Markets. ACORD Applications and three year loss runs will be required. Travelers is available in all states except AK, FL, HI, LA, RI & TX. There are over 2 million horse owners and 575,000 horse farms located in the United States. Be it racing, polo, hunt seat, dressage or just pleasure, a significant number of affluent individuals and families have a passion for horses. Horse ownership comes with unique risks and owners may lack the proper protection under their personal insurance programs. Congratulations to our agent in Florida on an Eagle Express sale of $7,391 in premium!